Born in Austin, Texas ... earned a degree in corporate communications in the spring and began work on a another degree in adverstising ... a three-time Academic All-Big 12 selection ... a three-time member of UT's Athletics Director's Honor Roll ... a prep honor roll student who was tabbed academic all-district three times ... active in UT's community service program ... participated in "A Brush with Kindness" helping to repair low-income homes ... is part of a group of Longhorns that regularly visits patients at the Dell Children's Medical Center ... helped with kids ministry at his church from junior high school through high school ... made two mission trips to Mexico during spring break of his freshman and sophomore years ... enjoys video games and music ... both of his parents received graduate degrees in business administration from UT. Started 14 games at left guard ... tabbed second-team All-Big 12 by The Associated Press and honorable mention All-Big 12 by the league's coaches ... twice named UT's Boss Hawg Award winner as the team's most productive offensive lineman ... helped Texas average 39.3 points (third NCAA), 421.2 total yards (29th NCAA) and 273.6 passing yards (22nd NCAA) ... cleared the way for 562 total yards, including 363 passing, against ULM ... blocked for 544 yards of total offense, including 353 passing, against Wyoming ... helped UT post 216 yards and 24 points in the second half against Texas Tech in a 34-24 victory ... cleared the way for the sixth-highest total offense tally in school history with 639 yards versus UTEP ... it marked just the second time in school hisotry that UT posted over 300 yards rushing and passing in the same game ... helped Texas put up 38 points and 313 yards against Colorado ... opened holes for UT's rushing attack to gain 142 yards, including 102 in the second half, on an Oklahoma defense that was ranked third nationally in rush defense (53.6 ypg) at the time ... cleared the way for 285 yards and 35 points in the first half and 400 yards for the game at Missouri ... posted 275 yards on just 56 plays at Oklahoma State ... helped UT gain 537 total yards, including the second-highest passing total (470) in school history, versus UCF ... helped UT post 317 yards and three TDs en route to a 40-0 halftime lead at Baylor ... paved the way for UT to post 51 points and 537 total yards versus Kansas ... cleared the way for 597 total yards, including 304 passing and 293 rushing, at Texas A&M. THE PROPOSAL by Charlie Tanner 2018- SHE SAID YES!!! 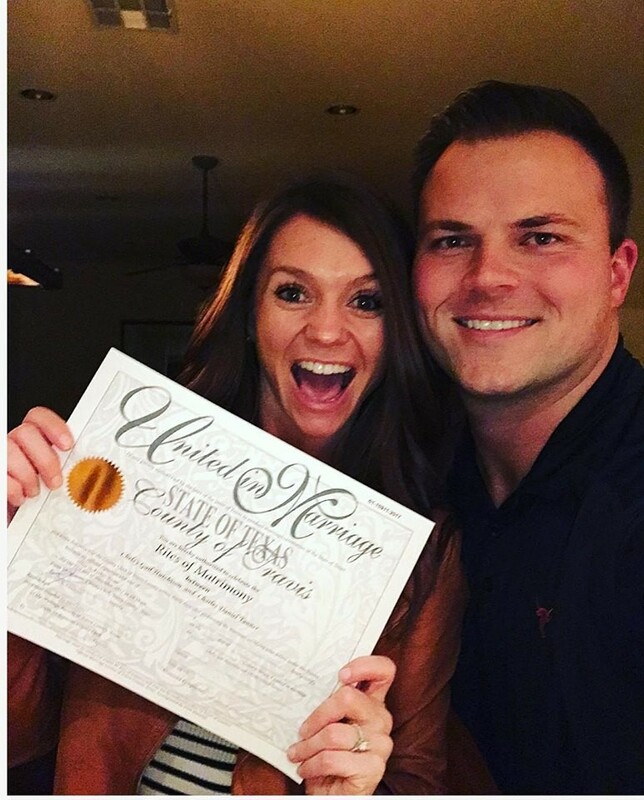 Charlie Tanner from the 2005 Longhorn football recruiting class married Chelsy Hutchison at Laguna Gloria on January 20th, 2018. Their honeymoon trip included Dubai, Thailand, and Tokyo. His groomsmen list was a whose who of Longhorn football players including Ryan Bailey, Henry Melton, Trevor Gerland, and Daniel Orr.